One Day in Macau | Where is Yvette? No, we did not fly to Venice within a week of touching down in Hong Kong- my understanding is you can no longer feed the pigeons there anyway so I suppose this photo doesn’t make much sense anyway. Plus the astute will notice that the tower on this St. Mark’s Square has an escalator going up to it, so where are we anyway?! 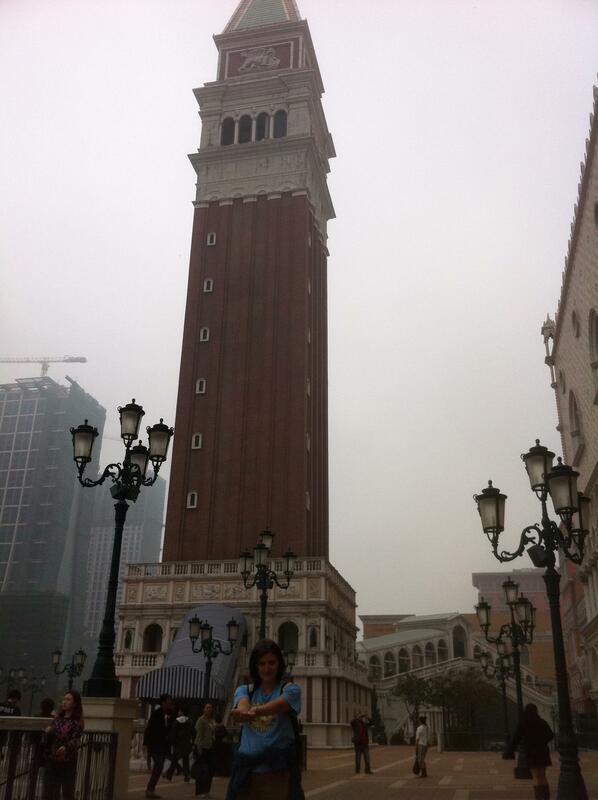 The answer, of course, is the Venetian casino on a daytrip to Macau. If Hong Kong was the British foothold in China back in the day than Macau was the Portuguese one (though of course both are now Chinese “special administrative regions,” same in name but different enough to have their own customs and non-filtered Internet), but while Hong Kong became a haven for finance Macau went off to become one for gambling. This has turned out quite well for Macau really as gambling is very big but very illegal in most of Asia so people flock from all over to come here, including of course Hong Kong which is a brief hour-long ferry ride away. There are free buses at the ferry arrival terminal eager to whisk you off to their respective casinos, which is good because Macau is still developing and it’s honestly rather difficult to walk between most of the points of interest anyway. But along the way we got some free herbal tea and took in an impressive free show and even found a 2-for-1 deal on ice cream- I know, what terrible tourists are we to spend so little money?! The casino we explored the most though was the Venetian which was both entertaining and off-putting in its fake-ness: there is a “canal” with singing gondoliers ready to give you a ride, for example, but it’s on the 3rd floor of the establishment and all indoors under fake-twilight lighting that never changes and Western shops filling the arcade. Huh? There was also a great show done by two wonderful opera singers that lasted about 15 minutes in “St. Mark’s Square,” presumably so short because the average tourist only can stand that much opera anyway. I’m getting cynical, I know, but I suppose fake glamor does that to me. (To be fair the Venetian did have one wonder I’d never seen before and got me very excited- an escalator that curved as it went up to the next story instead of going in a straight path!) So to spend a few words on gambling which is what I know most people are interested in anyway, I will admit I have a fondness for roulette. I have no idea why. The thing is though I am just as happy watching others bet literally thousands of dollars on one arbitrary roll than I am spending it, which is of course very nice for me. To prove this theory, we did bet 100 Hong Kong dollars (~US$12) on roulette. And promptly lost it all. I’m glad we got to see all the big casinos and lights, but doubly glad I got to do it in just a few hours! This entry was posted in China, Macau, RTW #2. Bookmark the permalink.